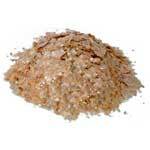 We are acknowledged as one of the chief Manufacturers of Mica Flakes in India. 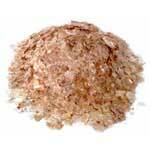 The Natural Mica Flakes made available by us are accessible in different grades as per the demand of clients. 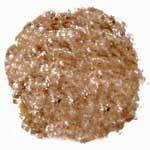 They are used as pigments in various industrial applications. We process Ruby Mica Flakes in specialized atmosphere to avoid any moisture or contaminations biotite (black Mica), quartz, straw, bamboo organic & inorganic materials). Colored Mica Flakes are used as raw mica material for regrinding, micronizing, sheet and pulp manufacturing for mica paper. Small sized of mica flakes are required for roofing felt industries, decorative purpose & mica board manufacturing to insulate the wall of houses for preventing noise, heat & ultra violet rays. Daruka Mica Natural Flakes are made out of selected Mica Scrap, Dried, Screened & Sheared. First the selected mica scrap is dried to avoid any humidity. Secondly mica scrap is screened to avoid dust. Thirdly all the foreign particles like biotite (black Mica), quartz, straw, bamboo (organic & inorganic materials) are removed by hand picking. Here we again screen the material. Now the material is ready to sheared (in grinding machine). Grinded material is then directly through blower sucked & blown in a round screen which is having blower to separate dust from the grinded material & the 8 mesh screen size to bring down the 2-8mesh NATURAL MUSCOVITE RUBY MICA FLAKES. In this case, mica scrap & waste are pulverized by mechanical grinders such as high speed hammer, rod, attrition, mills or cage distintefrators which reduce them to flakes and powder of different mesh sized ranging from 2 to 300 mesh. These flakes and powder are classified into various mesh sizes with the help of sieve classifiers. 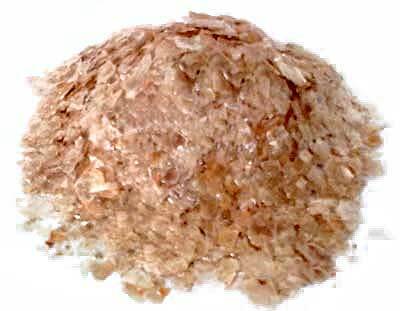 Coarse Mica Flakes: Plus 6 mesh, having a bulk density of 0.17kg/ltr. Have high percentage of relatively large flakes for sealing large openings. Fine Mica flakes: Plus 20 mesh having a bulk density of 0.20 kg/ltr are particularly used when a sealing agent is needed small enough to allow the mud to pass through a shaker screen without interfering with the operation. 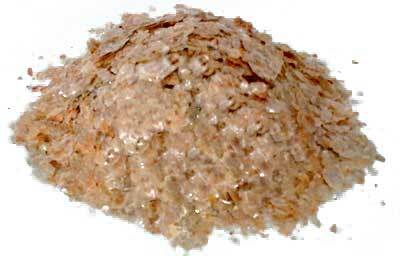 Uses : Natural muscovite mica flakes are used as raw mica material for regrinding, micronizing, sheet and pulp manufacturing for mica paper. Small sized of mica flakes are required for roofing felt industries, decorative purpose & mica board manufacturing to insulate the wall of houses for preventing noise, heat & ultra violet rays. Packing : It depends up to the customer. Generally it's packed in HDP, jute or paper bag of 10,25, 50kgs. Inspection : Can be carried out by the buyer of buyers nominated independent inspection agency before shipment at our works, i.e. P.O. Jhumritelaiya- 825 409, Bihar, INDIA. Capacity :In our machine we can produce 10 tons per duly screened.